Happy Monday! Today is my birthday and Tyler and I are currently in Las Vegas celebrating! If you are following along on Instagram, then you have seen some behind the scenes of our trip. My birthday present this year was getting to see Britney Spears in concert!!! (#BESTPRESENTEVER) I can't wait to recap our trip for you all on the blog later. 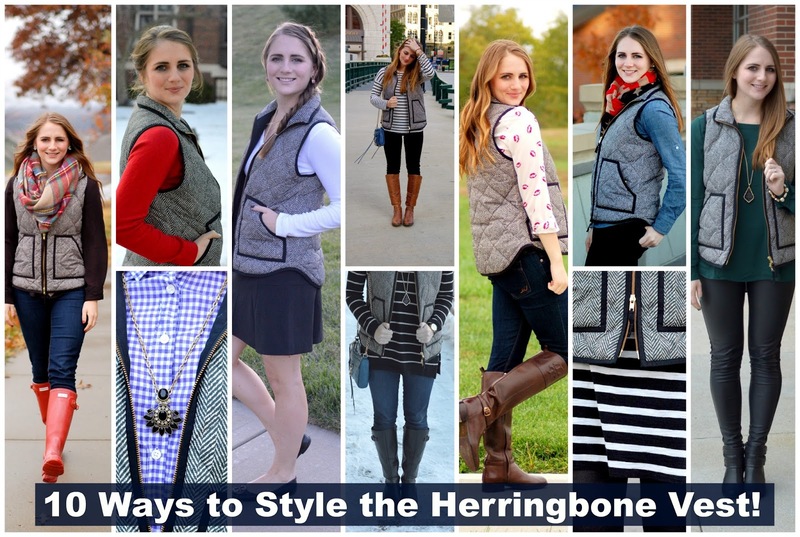 Today I am sharing with you all 10 ways to style the herringbone vest. I realized I have worn it multiple times here on the blog, so I wanted to do a summary post for easy inspiration. Also, I would love if you would pin the top image to one of your Pinterest boards! :) I have linked any similar items that are available below each picture. I have very white skin, so tanning is not really my thing :) You look fabulous, as always! great styling everytime, Happy New Year! Love this post because I'm obsessed with my herringbone vest! I love how you mixed it with other patterns here! My herringbone vest is such a staple piece.. I could wear it every day! It is so versatile, and I love that you can wear it with so much! Love this! So many cute ways to wear a vest. I really love the 1st one and the one with the kiss button-up shirt underneath. So cute! Happy Birthday! What a treat! I pinned your image. I really love the one with the red Hunter boots (I have a pair!) and it with the green top and faux leather leggings. Thanks for the inspiration! Happy Birthday Darcy! That is so awesome you saw Britney! I bet she put on a fabulous concert. LOVE that vest. It goes with everything. I love all of these, but I have to say my favorite is the herringbone with a basic long sleeve/blanket scarf and with stripes. I love the mix up of prints! Happy birthday! I hope you have such a great day! I love how you can style this vest so many ways! I'm so jealous that you're getting to see Britney in concert! I hope you're having the best birthday in Vegas and seeing Britney live! I can't wait to hear all about your trip! That vest I swear was the first and only time I have paid full price for retail and it was the best investment. It seriously goes with everything! I literally only have one vest in my closet--I obviously need to step up my game! So jeal you are getting to see Britney, that is on my bucket list! Happy Birthday Beautiful!!! So excited for you! Can't wait the see your "Vegas Baby" pictures!!! You deserve to be celebrated, may this night be Ahhhmazing.....like you!! I can't decide which look I love the most.Great combos. Love the vest! Is yours from J Crew? I have one that's a knockoff from last year and I haven't worn it much since.. thanks for the inspiration because I didn't know it goes with so many colors! Happy New Year! Hi Virginia! Mine is from the J.Crew Factory from last year! I'm in love with it. I am glad I could give you some inspiration! Happy New Year! You're literally the proof that you can wear that vest with anything. I love how you have so many options that mix patterns! Hi Darcy. I am going sort of backwards and catching up with one of your latest outfits but I definitely wanted to wish you a Very Happy New Year first of all. Hope 2016 is great all around! I will definitely catch up tomorrow on my day off. I have your blog and a few other I plan on catching up on. All right, I will catch up again very soon. <3 Ada. Every look is cute. Nice post! Happy New Year!! thanks for the ideas! you see this vest every where, all the same. glad to see someone switch it up! Whyyyyyy do I still now own one of these fabulous vests? ugh. You look so great... making me wish that I had one to wear right now! I love this post! I have a similar vest and I wear it all the time. Can't wait to hear all about your Vegas trip - I would love to see Britney in concert there! ahh happy birthday girl!! Love how you styled this vest in so many ways, I still can't believe I don't have a Herringbone vest! You have so many great options here!! I love this vest. Every time I see it out in the wild I want to run and buy it. You look amazing in all of these! I love all of these different ways you've styled your vest! I have a similar vest and I really love how deep the pockets are. Love the versatility of that vest! Such great staying ideas! All of these looks are so adorable! I love the one with the lipstick print! The ideas are endless! Happy belated Birthday! Too bad we just missed each other! I totally needed this post! I have had a vest since November and still haven't found just the right pairing to make me feel like it's working for me. I think I should have sized up too so that is probably one reason it's feel off. My favorite is the lip print blouse! I have seen this vest all over IG , but I have not really thought it was something I would wear. I love the way you styled this one piece and I will have to pick one up next time I see one on sale! I hope you had a nice birthday once again. Happy belated 25th! I bet Vegas was fantastic! I keep coming back to this super stylish post with that amazing herringbone vest. The first outfit, the third one and the last two (in the order you listed them) are my favorite ways you styled the vest. I like the vest best with the stripes, any variation you are wearing actually. I'm not so fond of the plaid, maybe because it's purple.